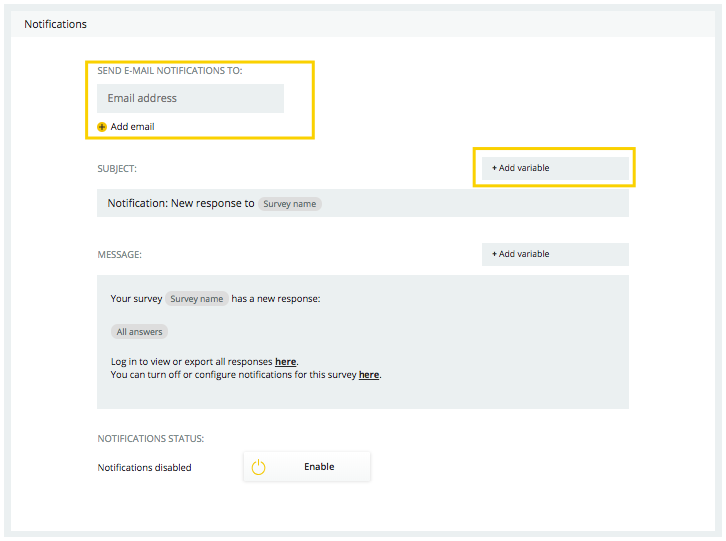 Notifications update you right after someone finishes the survey – we will send you an email with responses and the contact information of your respondent in real time. Notifications help you act on the feedback immediately, for example when someone reports a problem with your website. ✅ We recommend integrating them with your helpdesk, to keep all your tickets in one place! You need to enable Notifications for every survey separately. Go to Survey Settings > Notifications. There you can see and change email content and provide us with the email we should send answers to. If you want us to send you more data you can add placeholders using ➕Add variable.